The Kardovsky House (30, Moskovskaya Street). Located by the road not far from the Trinity Monastery is a modestly sized yet soundly built country estate. Adjacent to the agreeably spacious one-storied wooden manor is a large plot of land that used to contain an orchard and a vegetable garden. The building once wore the sign of the year it was constructed, 1885. Since 1915 the estate has been owned by Dmitry N. Kardovsky, Fellow of the Fine Arts Academy. 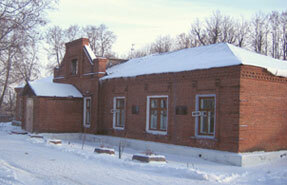 D.N.Kardovsky was born in 1866 in the Osurovo manor in the vicinity of Pereslavl-Zalessky. He is known as a master drawer, an excellent teacher and a theatre artist. A significant part of his life and work is connected with Pereslavl. He spent his last years at his Pereslavl “dacha,” where he died in 1943 and was buried on the grounds of the Pereslavl Museum. In 1954 the Academician’s daughter, Ekaterina Dmitrievna, donated the dacha to artists. Later, a small inn was built near the old manor to accommodate visiting artists and sculptors. Today this compound is known as the “Kardovsky House of Creative Arts”. Emerging today among the ancient edifices on the old streets of Pereslavl are nice-looking modern houses and buildings. The town is gradually transformed becoming more convenient for the residents and the guests. These new developments throw into sharp relief the charm of the old buildings – keepers of the memories of the years long past.